A prospective parent applying for the HAT program recently asked a great question that I want to share with you all. She asked, “What makes the High Altitude summer camp different from the [shoe brand] summer camps that I have researched which are located here and throughout the U.S.?” I love questions like that, and my response was shaped in the form of a story of sorts. 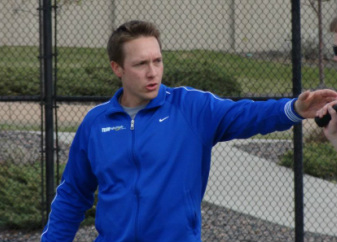 Ryan Segelke – Founder, High Altitude Tennis LLC, The HAT FUND, Inc.
What was my response? I described the scenario which we have all experienced when you get onto an airplane: you get comfy in your seat and begin a surface level encounter with a very nice person sitting next to you. You don’t feel as if you have a choice since you will be spending the next three hours next to this person and you don’t want to seem rude or anti-social. So, you make the most of it. And, besides, you might learn something new! You open up the conversation by asking if they are returning home or heading off for vacation and the conversation continues from there. By the end of the three hour flight, you have learned some very basic, surface-level information about the person next to you. And, who knows, maybe you exchange cards so you can grab coffee sometime in the future (in my experience, even in the best of connections, the likelihood of actually grabbing coffee is near zilch). Ninety-nine percent of the time, this encounter does not get beyond the initial conversation. There is just typically not enough time or genuine interest to delve into deeper issues that may be going on in each of your lives. This is what makes High Altitude Tennis Academy unique. We take great pride in delving deeper to understand what makes each individual student tick. The vast majority of general summer academy offerings sponsored by local colleges and big name-brand shoes are not meant to go beyond this surface-level encounter. And if you look close enough and ask the right questions, you will find just that. This is not a bad thing by the way! With roughly 25% of the families that I talk to, the student is not yet ready for intensive training and is 100% suited to attend a basic camp. And I always recommend and refer them appropriately if this is the case. The feedback I recieve weekly is that there are a large pool of players who have enjoyed and had fun with this type of program but have realized that they have now outgrown this experience and are craving more. A portion of that group is just at a loss and not clearly able to articulate the breakdown they are having. They sense that this fun but non-intensive camp experience won’t get their child to their ultimate goals, yet they aren’t sure what else is out there…That’s where we come in! If the young scholar-athlete is “driving the bus” and asking for more intensive training and curriculum that includes competition with players from around the world and mom and dad are supportive of not only their child’s aspirations but our champion methodology, that’s a family we are looking for! At the end of the conversation, I emphasized strongly to the prospective parent to have a fun but serious talk about what their young athlete is ready for and, based on that conversation, invest their money appropriately. So, that’s the question I leave you all with today: are you looking for a surface level encounter? Or are you looking for something deeper and more meaningful? I would speculate that this is a question that can be thought provoking concerning all parts of your life in today’s fast-paced, over-stimulated, instant-gratification world. But we will leave that for a different article! We hope that you are enjoying the HAT monthly newsletter! Do you have a specific question you would like to see answered by me in a future article? E-mail me directly at ryan@highaltitudetennis.com, and thank you from the bottom our hearts for allowing us to be a part of your child’s journey!